Home » With Our Churches » Heartland Community Church » Heartland: What do Babies, Chowder, Photobombers and Romania Have in Common? Heartland: What do Babies, Chowder, Photobombers and Romania Have in Common? The main draw was Pastor Andy Woodworth’s authentic Maritime clam chowder, a culinary skill he had honed while living in PEI. LANDMARK, Man.—What do babies, Maritime clam chowder, peace-loving photobombers, and Romania have in common? Answer: Emma Woodworth and her short-term mission opportunity. Fall socializing and fundraising go hand in hand here at Heartland after the summer holidays. Friends and family of Emma Woodworth helped her host a savoury soup luncheon for her trip to Romania in December 2017. 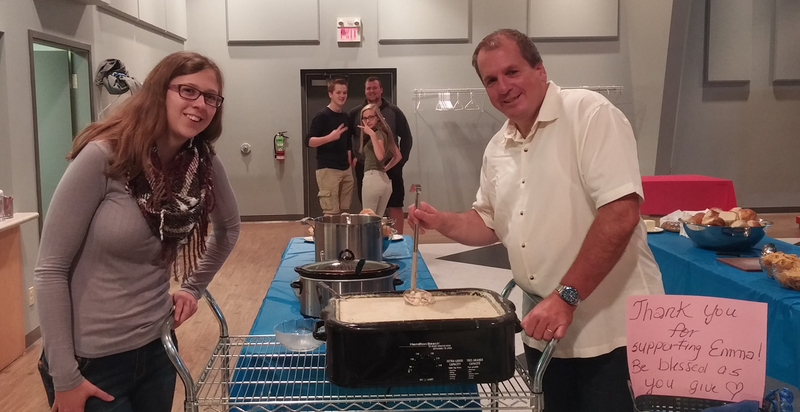 A variety of soups were served after the morning service on Sept. 24, but the main draw was Pastor Andy Woodworth’s authentic Maritime clam chowder, a culinary skill he had honed while living in PEI. Emma will be plugged in at the Rasa Family Centre, a mission of Gateway to Hope (Romania), where she’ll be a conduit of God’s love and compassion for needy infants. She will also be helping families who come there for support and care. Emma’s ministry connection was made after one of the founding couples of the mission was visiting family members who attend Heartland. Only five days later, on Sept. 29, we gathered once again to be “Heartlandish.” Connecting with our neighbours, both old and new, over a hot meal of ham, scalloped potatoes, and baked beans, as well as fresh local produce and an assortment of homemade pies, has become a treasured tradition. We served 325 people and raised close to $3,000, which will go toward the purchase of a new fryer for the Landmark Arena. A special thank-you to our Missions Committee and co-ordinators, Clara Sawatsky, Marilyn Plett, and Deb Reimer for another successful event. On the hottest Sunday in the month, on Sept. 10, our social committee hosted an old-fashioned wiener roast and bonfire at the Keating homestead. Though I could not attend, I heard it was enjoyable, and this type of evening may happen again next year.